Peter never saw himself as an ocean expert, so he surrounded himself with the best and brightest ocean minds he could track down. He knew that long-term solutions to protect our seas would only come if new thinking, new ideas, and new behaviors were fostered across a range of marine expertise. This inspired the idea for a new kind of ocean conservation award. The Benchley Awards were co-founded by Wendy Benchley and David Helvarg, and named in honor of Peter. The Awards celebrate the life and legacy of a man who spent more than 40 years educating the public and expanding awareness of the importance of protecting sharks and ocean ecosystems. 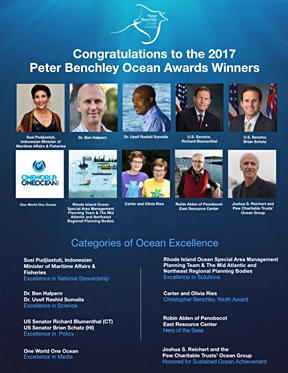 The Peter Benchley Ocean Awards are the world’s preeminent ocean awards and are unique in acknowledging outstanding achievement across many sectors of society leading to the protection of our ocean, coasts and the communities that depend on them. We are grateful that the larger marine community sees the awards as an important factor in bringing world leaders, scientists, and policy makers together to elevate marine conservation on the global agenda and move it forward. It is a humbling testament that they refer to the Benchley Awards as the “Academy Awards for the Ocean”. At the heart of every great non-profit, every policy initiative, and every activist success story, are the tireless efforts of extraordinary individuals—marine scientists, policy makers, photo journalists, explorers and activists— who have committed their lives to working on important ocean issues. To date fifty-six Benchley Ocean Award honorees have been recognized for excellence and achievement across many ocean conservation disciplines. 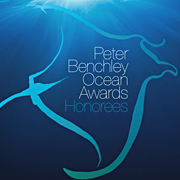 Click on this PDF or the icon below to view our acclaimed Peter Benchley Ocean Awards Honoree 2014 Book.